Vegan Bytes #51- At Last... The Colors of Summer Are Back! *Question: Needs Encouragement: "I'm considering going vegan after reading Eat to Live." 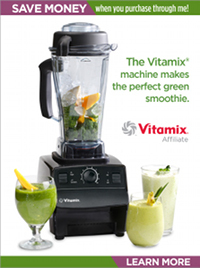 *Vegan Product: Why is My Vitamix So Great? **Note: Some email servers don't allow you to click these links above. If you can't click them, just scroll down in your email to the sections you want to read. As summer comes in the Northern Hemisphere, it brings an influx of stunning colors in nature; the bright red of raspberries, deep red of cherries, orange peaches, yellow summer squash and corn, green in zucchini, peas, and cucumbers, purples in blueberries and kohlrabi. It's by far my favorite season of the year, and the abundance of fresh fruits and vegetables are one of the top reasons. Almost every nutritionist will encourage you to "eat from the rainbow" and try to get as many of the different colors from real food every day. Sometimes it can be hard to visualize what that means, so I put together a page to show what's on that rainbow of produce. This list of fruits and vegetables is one of the most popular pages on Vegan Nutritionista. 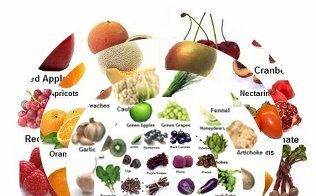 Check out my charts on the different colors, which show the nutrients in each color and examples of different types of fruits and vegetables. Whenever I visit NYC, I am in utter awe (and loosely veiled jealousy) of the sheer number of vegan restaurants, and then specifically, of the quality of those I get to visit. I just don't live in a world where I can often pick anything I want on a menu without having to bother the server with a game of 20 questions. So, when I had the chance to pop into the city just to eat lunch and walk around a bit, it was no easy decision to pick a place to eat. When we saw there was a new, second location of Cafe Blossom in the village, we found our winner. So, how did I like it? Read my review of Cafe Blossom here. "Need encouragement: I'm considering going vegan"
I went vegetarian years ago because of how animals were treated, then slowly slipped back into animal consumption and continued to blindly consume animal products for another eight years or so. After reaching an enormous 223 pounds, I tried a raw vegan diet without much success and quickly gave that up. 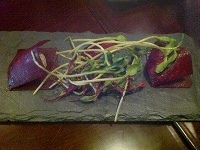 The vegetarian and vegan lifestyle has always appealed to me, but seemed like a world so out of my reach. I did eventually lose about thirty pounds or so through calorie restriction and juice fasts, but you can imagine where that got me. After the birth of my 2nd child I have now lost nine pounds past the initial baby fat loss and I've been stuck in this calorie restriction/ binge cycle. My weight is not doing a thing, I don't feel well, and as you can imagine my self-esteem is low. I recently came across the Eat to Live book while searching for yet another starvation diet. I ordered the book immediately and am devouring it! I can't get enough of this information. It makes so much sense and totally makes the American diet look extreme and not the vegan. 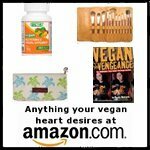 I started the vegan diet before even receiving the book, mostly to start the healing and weight loss process. Before reading the book I was considering adding back some animal products after eight weeks of a strict vegan diet. But after what I've read and all the years of my unhealthy eating, I'm considering never eating animal products again! Right now I feel very new and vulnerable and alone. 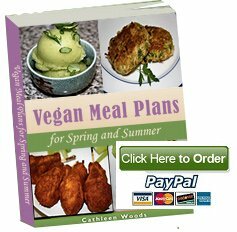 I know there are many vegans in my area and I am going to try to seek them out for support. I know what I'm doing is the right thing and look forward to a life of health! Please offer support and encouragement to this woman who is considering going vegan, but could use a little cheering from our side. This recipe for chocolate banana ice cream is one that I whip up often, and one that I love, but one that I can hardly call a recipe. It's more of a method than necessarily a recipe. But, people are always asking me for exact recipes, and since this tastes so good, I'd be remiss not to include it and highlight it. It's a perfect recipe for the Vitamix because the horse power allows the crystals to break down into smooth, creamy, goodness, but if you have a strong blender you should be able to get a smooth texture. Once you've made one version of this raw ice cream, you can deck it out with your favorite flavors, mix-ins, and toppings. Check out my quick and simple raw ice cream "recipe." I absolutely adore my Vitamix. It was something on my wish list for several years, and my husband got it for me as a gift. I know, I know, men aren't supposed to buy women appliances for romantic presents. The Vitamix is an exception to that rule. I use it on average once a day. Some days I don't pull it out, but other days I make a smoothie for breakfast, clean it out, blend pesto for lunch, clean it out, make a quick hummus, clean it, blend a vegan parmesan from almonds and nutritional yeast, clean it, and then make a sorbet for dessert. It's one of those things where if you have been using it for awhile and then go back to a regular (expensive, not cheap) blender, you're baffled at why it doesn't crush, pulverize, blend, whip, or create the smooth texture like your machine. And yes, it's expensive, but you get what you pay for. Check out my full Vitamix review here. When someone is thinking about going vegan but wants some conclusive evidence for why we don't need to drink milk or worry about consuming enough protein, one of the first books I recommend is The China Study. I think the reason it's so convincing is because it is written by a doctor who previously argued that children needed more protein and calcium from milk in order to be healthy. He had developed that theory based off what most of us are taught, that milk does a body good. When he got into the field to research it, he realized his theory was wrong. Dead wrong. He realized that everything we have come to accept as fact about milk was incorrect. Read all about The China Study, and if you want to pick up a copy to read or share with a friend, you can find it on Amazon. 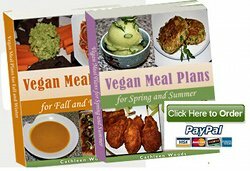 And don't forget, a percentage of all Vegan Nutritionista profits go to a rotating group of charities that benefit animals. This quarter we're giving money to Farm Sanctuary.